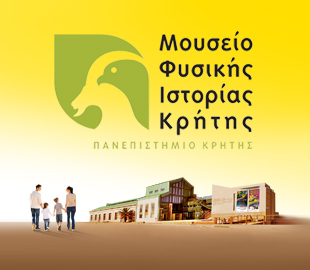 The Natural History Museum of Crete receives no funding from the Hellenic Ministry of Culture or any other institution, so the support of its "Friends" is crucial to its survival and growth. 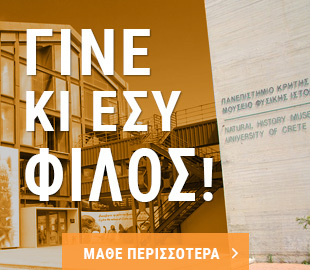 Become a member of the Natural History Museum of Crete Friends’ Association and help us develop and enhance our activities! By becoming a member you contribute to the museum’s charter goals, i.e. : developing its collections (via fieldwork, excavations, sample purchases, etc. ); maintaining its collections and exhibits; caring for wild animals and protecting endangered species; producing publications on nature in Crete and the Mediterranean; holding seminars, lectures, conferences and temporary exhibitions on the natural environment, as well as environmental education activities; and promoting lifelong learning. Your annual subscription grants you a number of special privileges, such as free entrance to the museum; a 15% discount at the NHMC shop; and on all activities organized outside the exhibition space (e.g. excursions, seminars etc. ); instant e-mail updates on anything new concerning the NHMC Friends’ Association and the museum itself. • Group membership: € 10 / person for> 20 adults – (members of Parents and Guardians Associations); each adult may sign up one child to the Agathopontikes Young Friends’ Club. Applications for concession rates should be accompanied by supporting documentation. Note: Children of NHMC Friends’ Association members are entitled to automatic membership of the museum’s Agathopontikes Young Friends Club.